When you're fighting crime in Arkham City, it pays to bring a change of clothes. For someone who ostensibly spends all his time dispensing justice on the streets of Gotham City, Batman seems to have a surprisingly large amount of time to try out new looks and accessories. Fortunately for gamers, Batman's flirtations with the world of fashion design has given rise to no less than five alternate costumes in Arkham City, including outfits from two animated series, and a graphic novel that isn't actually out yet. 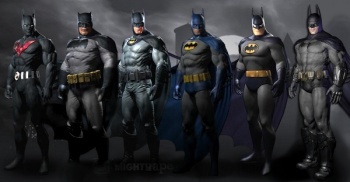 Going from left to right, the alternate Batsuits are as follows: Batman Beyond, The Dark Knight Returns, Batman: Earth One, Retro 70s Batman, Batman: The Animated Series, and the default Arkham City skin. For those not up on the Batman multiverse, Batman Beyond is a animated series set decades in the future. Bruce Wayne, who is an old man now, has passed the mantel of the bat, along with high-tech Batsuit capable of flight and invisibility - powers that won't be making it to Arkham City - to a successor. The Dark Knight Returns is also set in Batman's future, where a middle-aged Bruce Wayne is forced into becoming Batman again as crime in Gotham City gets worse and worse. The Dark Knight Returns was released in 1986, and created by Frank Miller of Sin City and 300 fame. Batman: Earth One takes the opposite route, and is set in Batman's past, telling his origin story in light of the new DC continuity. Earth One is scheduled to come out at some point later this year. Retro 70's Batman doesn't need much in the way of explanation: it's the suit that Batman wore in the 70s. The Animated Series costume is pretty self-explanatory too, although it's interesting - not to mention rather exciting for fans of show - to see that Rocksteady has tried to make the character model look as much like the show as possible. It's not going to gel particularly well with the rest of Arkham City's art, but you can't have everything. Gamers can pick up the different costumes by pre-ordering Arkham City from different retailers. Not every costume is going to be available in every country though, so getting them all is going to take some work.